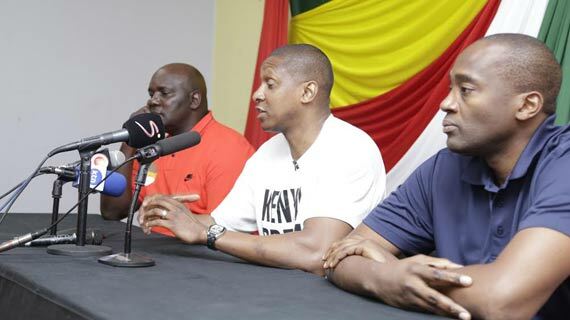 Former National Basketball Association (NBA) star and current Toronto Raptors General Manager Masai Ujiri has urged the government to give full support to the Kenya’s basketball to enhance the game’s growth in the country. The former Denver Nuggets general manager has also challenged the government to fund youth progrmames and structures that will propel the game of basketball to the next level in Kenya. “Federations like Angola that were lagging behind several years back are currently far much ahead because their governments decided to step in and fund youth basketball and relevant sports programmes,” said Ujiri. Ujiri said Nigeria, Kenya, Senegal and Cameroun have great potential but a lack of government involvement has thwarted the discipline growth in the mentioned nations. Ujiri strongly believes Kenya can excel in regional and continental championships if proper preparations are put in place for the national teams. The Nairobi Basketball Association chairman Ronney Owino also urged the government to step in and sponsor the men and women’s national teams currently training ahead of the Africa Zone V championships to be held next month in Kampala, Uganda reiterated this point. “Our players need allowances, proper kits and diets. Also better training facilities will enhance their perform in Kampala which is a qualifier for the All Africa Games next year,” said Owino. Owino flanked Ujiri and other notable NBA coaches at a running three-day international youth basketball camp at Brookhouse School in Nairobi. The camp, which is part of the prestigious Giants of Africa basketball project involve 50 players drawn from Kenya, Democratic Republic of Congo, South Sudan, South Africa, Ethiopia, Uganda, Tanzania, Rwanda and Burundi. “Basketball grassroots development in Africa is critical. Africa has the potential for growth and being a force to reckon with in NBA,”said Jama Mahlalela from Toronto Raptors. Jeremy Desta, 16, from Lukenya School noted he is glad to be part of the 50 players who are being taught the basics of basketball including life skills at the camp. Ujiri and his team have great plan for the first ever high profile basketball youth camp in East Africa, which they have pledged to expand in the near future.The camp’s mission is to use basketball as a tool to educate and enrich the lives of the youth of Africa. NBA Africa President, Amadou Fall is attending the camp. Others who are also present to offer skills to the camping youths include Godwin Owinje (Radarhoops), Jama Mahlalela, Patrick Engelbrecht Michael Akuboh (all of Toronto Raptors) and Patrick Mutombo (Denver Nuggets).